In "The Wind Through the Keyhole," Stephen King returns to the rich landscape of Mid-World, the spectacular territory of the Dark Tower fantasy saga that stands as his most beguiling achievement. Roland Deschain and his ka-tet"--"Jake, Susannah, Eddie, and Oy, the billy-bumbler--encounter a ferocious storm just after crossing the River Whye on their way to the Outer Baronies. As they shelter from the howling gale, Roland tells his friends not just one strange story but two . . . and in so doing, casts new light on his own troubled past. In his early days as a gunslinger, in the guilt-ridden year following his mother's death, Roland is sent by his father to investigate evidence of a murderous shape-shifter, a "skin-man" preying upon the population around Debaria. Roland takes charge of Bill Streeter, the brave but terrified boy who is the sole surviving witness to the beast's most recent slaughter. Only a teenager himself, Roland calms the boy and prepares him for the following day's trials by reciting a story from the "Magic Tales of the Eld "that his mother often read to him at bedtime. "A person's never too old for stories," Roland says to Bill. "Man and boy, girl and woman, never too old. We live for them." And indeed, the tale that Roland unfolds, the legend of Tim Stoutheart, is a timeless treasure for all ages, a story that lives for us. King began the Dark Tower series in 1974; it gained momentum in the 1980s; and he brought it to a thrilling conclusion when the last three novels were published in 2003 and 2004. 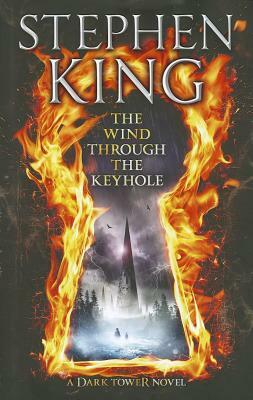 "The Wind Through the Keyhole "is sure to fascinate avid fans of the Dark Tower epic. But this novel also stands on its own for all readers, an enchanting and haunting journey to Roland's world and testimony to the power of Stephen King's storytelling magic.